We’re thrilled to reveal the video of the #conroelakehouse project! Hear what our clients have to say about working with Duckworth Interiors! This house is getting lots of LOVE on social media so it is my pleasure to give you guys an official tour via the blog! Because we truly got to be a part of every room in the house, we have A LOT to show you. We’re revealing it in 3 parts, the exterior and the interior parts I & II. We’ve already given a the tour of the exterior, so if you missed that click here and the Interior Part I, for that click here. Now let’s move on to the Interior Part II which will cover the upstairs and master suite. Let me start by saying that this house was a huge collaboration and only turned out as fabulous as it did because so many talented people came together. The plan design was done by Wyrick Residential Design, it was built by Blakecraft Homes, the landscape and pool design was done by Smelek Design, and the beautiful photos you’re about to enjoy were captured by Grant Duckworth Photography. 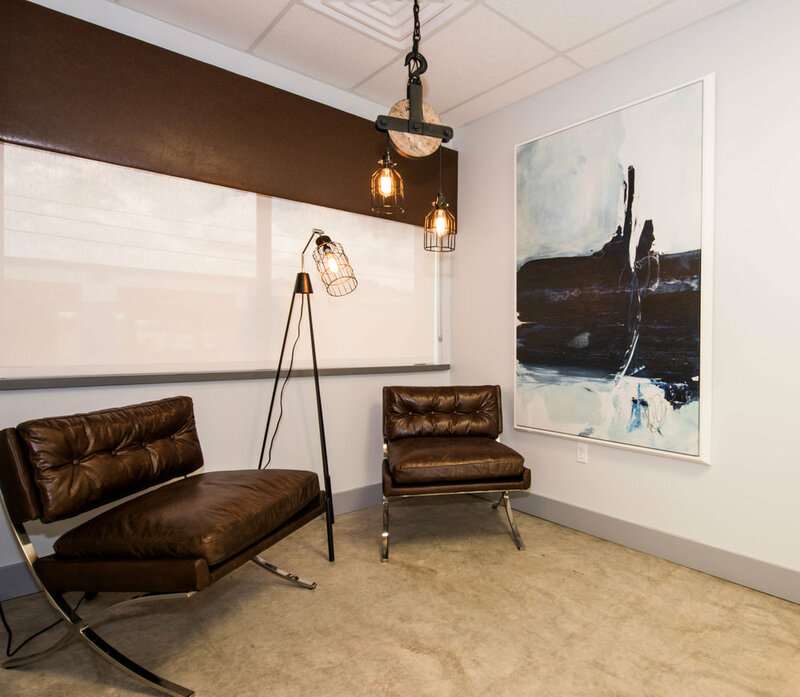 Duckworth Interiors provided the construction selections as well as the turn-key interior. I’m going to start by taking you through the utility areas of the house. They’re a little less glamorous but they are so necessary! When you come in from the garage, you’ll find this great little mudroom built-in, perfect for grabbing or stowing your last minute essentials. Come further down the hall and check out the adorable laundry room! I just love the floors in here. I was nervous about using such a large tile in such a small room but was so pleased with the results. I also love the whimsical pineapple window treatment here, because, why not? With windows and doors filling two of the walls, you’ve got amazing golf course and pool views. But what about when you want to watch a movie? No prob, we’ve got remote control window shades that allow you to go from a bright beautiful view to blackout in a few seconds. Bookcases really are an art form. We’ve styled them minimally here. Our homeowners will have room to add family photos and trinkets without it feeling cluttered. Also off of the hallway is the staircase, let’s head upstairs… At the top of the landing, before you can really start to take in the game room, you’ve just got to stop and admire this piece of art. There’s also a hidden door on this wall, can you spot it? The stairway and the upstairs game room have board and batten walls, which are just so much fun and immediately help the space feel more casual. Go through the awesome barn doors and you’ll enter the lady of the house’s space! Being a very talented painter, she needed an in home art studio and this former art major was delighted to oblige! Really, this pendant is everything! Sometimes, when I’m looking for something so specific, like a table of certain dimensions, with wheels and in colors that compliment our color scheme, I have to ask the hubs to just make it! Thankfully, Grant was able to easily build and finish this art table. In the hallway between the bedrooms, you’ll find this adorable reading nook. I truly enjoy reading nooks… I was an avid reader as a child and would have been thrilled to use something like this! In this bedroom, you’ll notice a custom made bunk bed wrapped in shiplap. The bookcase is a hidden door that makes another great hiding spot for a child. And en suite bath. The tile in this bathroom makes me so happy! Who knew that turquoise herringbone and carrara marble fans would be such good friends? I mean, how nice is this??? I love this arched alcove for the free-standing tub… We chose to only tile the back wall for added impact. This mosaic really ties all of the materials together! We really considered every detail in this house from plumbing fixtures, tiles, lighting, hardware, furnishings and accessories. I hope you can see that this was a labor of love and we LOVE what we do!!! Thanks for stopping by and make sure to subscribe so you don’t miss our next post! This house is getting lots of LOVE on social media so it is my pleasure to give you guys an official tour via the blog! Because we truly got to be a part of every room in the house, we have A LOT to show you. We’ll be revealing it in 3 parts, the exterior and the interior parts I & II. We’ve already given a the tour of the exterior, so if you missed that click here. Now let’s move on to the interior part I which will cover most of the first floor. When you first walk in this home, it’s truly so delightful you don’t know where to look first. After you finish getting over the AMAZING front doors you might look UP to appreciate just how large this foyer is! When you look up, you will not be disappointed by the view!! This tray ceiling with painted v-groove and stained beams is just the backdrop for this elegantly industrial chandelier. If you love Edison bulbs, well, this one’s for you! Turn right and you see the fully functioning study. The man of the house works from home and this study needed to be beautiful but really practical. He’s also an avid golfer and former golf pro so he really wanted a study to display trophies, prints and memorabilia from over the years. We’ve all seen the dated “golf study” so it was time for a fresh, non-stuffy take on it. In doing so, you have to walk past this amazing bookcase and you have to stop and admire it for a moment. This is typically a place (next to the fireplace) where people put a built-in. I’m a big fan of leaving some spaces for unique pieces of furniture. You have more flexibility with the space and usually end up with something more visually interesting. Oh this family room… you just really feel like you’re on vacation in here. And who doesn’t want that??? Here you’ll notice a coffered ceiling. A simple shiplap clad fireplace. The firebox has a herringbone brick and the firebox surround is the same quartz material we used on the kitchen perimeter. Another great industrial light fixture. In this little alcove that leads to the master suit, we’ve got an awesome art light and beautiful piece from the homeowners collection. Our drapes are a slouchy linen. The upholstery and pillows are all white and blue. We have a seagrass rug layered with a cow hide and the tables are reminiscent of driftwood. If you venture just past the built-in china cabinet, you might find a spot you don’t want to leave… the BAR! Did I mention these homeowners like to have fun? Pour yourself a drink… there’s lots to choose from and check out the awesome groin vault and light fixture above. Run your hand across this really unique countertop, a leathered quartzite and admire the way the light sparkles in the antique mirror backsplash. THE KITCHEN! Lots to see here, where to begin? When we went to the candy store, I mean the granite yard, the homeowners and I really fell in love with this island material, which is a quartzite called Sea Pearl. We searched high and low to find the material in the size, thickness and finish that we needed. This material inspired the island color, and the backsplash. In fact, we loved it so much, we wanted to give it a white backdrop in order for it to command the attention. Shiplap on the hood wall is friends with the shiplap on the fireplace. A gorgeous beam is set into the stucco hood. Adjacent to the kitchen is the gorgeous dining room. I skipped the rug here on purpose. Don’t be afraid of these white chairs in the dining room… they’re actually outdoor fabric! Imagine dining here and looking out onto that stunning view! Can we talk about these pendants for a second? I’m obsessed. They’re my favorite lights in the house! To the left of the dining area, we have this awesome serving area with a special gift for the lady of the house. She had admired this photographer’s work (Gray Malin) for a long time and had always wanted to own one of his pieces. I conspired with her husband and daughter to select and purchase it with out her knowledge. The first time she saw it was on reveal day! I love getting to be a part of these special moments! Just off the dining room the guests have easy access to this beautiful powder bath. This blue and metallic wallpaper is such a compliment for the concrete sink. Besides the master suite, which I’ll show you in my next post, there is one guest bedroom down stairs and it’s so inviting! I hope you enjoyed Part I of the interior tour! Leave us a note and let us know what you think! Please subscribe so you won’t miss out when we reveal Part II of this project! This house is getting lots of LOVE on social media so it is my pleasure to give you guys an official tour via the blog! Because we truly got to be a part of every room in the house, we have A LOT to show you. We’ll be revealing it in 3 parts, the exterior and the interior parts I & II. First up is the exterior! The homeowners and their 3 children actually lived in this neighborhood and played this golf course for many years. This hole on the golf course was always their favorite, so when they got the opportunity to purchase this lot, they jumped on it. This lot came with a very tired and out dated home that got demolished. The first time we visited the property, it was an empty lot. Today this home is a dream realized. You’ll notice a nice mix of exterior materials… painted brick, stucco, and shake siding. You notice shingles and metal for the roofing. Bronze windows and front door provide a beautiful contrast to the white brick and stucco. The cedar accents and gas lanterns add so much warmth. This back yard was really built around this incredible view. Beyond the pool, there’s a creek and beyond that the immaculate golf course. One gets the feeling that they are visiting a private resort rather than an individual’s home. One element to the pool design that I really love were the steps going across the pool. Smelek Design was so clever to add these “lily pads”. There’s plenty of room for entertaining and dining outside on this covered patio! I hope you enjoyed our tour of the exterior! Leave us a note and let us know what you think! Please subscribe so you won’t miss out when we reveal the rest of this project! Here’s a new video explaining our turn-key process, featuring the #moderncoastal project! 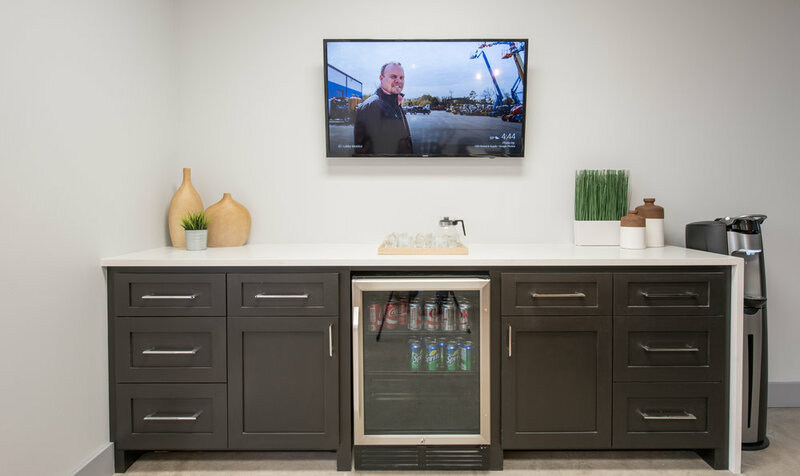 This was such a fun project and we loved having our hand in it from an empty lot to completely furnished with drinks in the refrigerator! Shout out to one of my most favorite builders, Blakecraft Custom Builders and Wyrick Residential Design on the plan design. Real Content Solutions did an awesome job putting this video together for us, ENJOY! Are you ready to see the inside of this beauty?! Come on in... let me give you the tour. Step into the foyer and you're greeted by the antique brick, reclaimed wood painted ceiling, and iron lantern. Here's a better view of that ceiling. Then turn to your right and you'll find a masculine study. We painted the trim and built-in a darker grey in this room and brought in some brass accent lighting by Circa. Love the French doors along the front of this house! Just need to fill this decanter with some fancy bourbon! At least, that would be my choice! Turn to your left and step into the formal dining room. You'll find a gorgeous chandelier, a subtle wallpaper and some fabulous custom drapery. Between the formal dining and the kitchen sits this handy wine bar. Compact and close for entertaining. Notice the seeded glass on the cabinet doors and the antique mirror backsplash. Come further into the house and you'll find the main living areas, family room, breakfast, sitting area and kitchen. Let's look at the family room first. The homeowners really did an incredible job sourcing so many architectural salvage items from Louisiana. My favorite has to be these beams from an old barn. This fireplace design was something we came up with on the fly. The builder called and need to tell the brick layers what to do. I pulled out a sheet of paper and made a very crude sketch and texted a pic back to him. I had never layered antique brick on top of painted brick and I'm so pleased with the way it turned out. Here's a close up of the awesome fans we found to go on top of the beam! And now we go to the kitchen... I really just can't even handle this kitchen. I love everything about it. We chose to paint the uppers the same color as the trim and the lowers are almost black! These stunning floors you keep seeing are reclaimed heart pine the the homeowners also brought in from Louisiana. I know... they're my favorite floors ever. AND my sweet husband got the chance to build the table for this family... so special! Here's a close up... he's kind of a big deal, y'all. A farmhouse sink, of course! So this gorgeous door had been sitting in the builder's garage for a long time. I said, please can we put this on the pantry??? He agreed. Since the home was custom, the builder could have the pantry opening framed to fit the door. Who wishes their pantry was this organized? ME!!! Beyond the kitchen, there is a side entry to the home with awesome brick floors and a great built-in. Keep going down this hallway and you'll find the laundry room. I sure wouldn't mind doing laundry in this room! Shiplap, a concrete countertop and adorable sconces. Another great built-in across from the laundry room. Now let's head to the master bedroom where you'll find an accent wall of navy grasscloth, a beautiful chandelier and a wall full of slouchy linen drapes. I find grasscloth to be one of those papers that never goes out of style and appropriate in almost any home. And lighting is always the "jewelry for the outfit". Now, head on into the master bathroom. The homeowners wanted to carry the wood floors into the bathroom... I wasn't sure at first because I'd never done it but I think it was definitely the right call! That allowed us to use this awesome cement tile under the tub and in the shower that otherwise, would've been too busy for such a large bathroom. We used a beautiful grey on the cabinets that really compliments the gorgeous super calcatta slab on top. Brushed gold faucets, sconces and hardware. Another first for me was to go sans tile behind the tub. I really love the simplicity that gives. More fun cement tile, a freestanding vanity and vessel sink. We carried the floor tile into the shower. I like to do this and eliminate the curb, it always makes a bathroom feel larger and makes the shower more accessible. Another cute bathroom is for the homeowner's two small boys to share. Light grey cabinets, a faucet that will be fun for them to use and industrial lighting and mirrors. The homeowners opted to make a locker room style shower "wet room", with a shower head on each end, no doors, and tile on all the walls. We designed this fun floor detail. That's the end of our tour! This house was so much fun to work on and I'm so glad I got to be apart of it. Again, I had the privilege of collaborating with Wyrick Residential Design on plans, Blakecraft Homes on the build and Chip Gillespie on the photography. Thanks so much for stopping by! What's your favorite part? It's project reveal time! I'm thrilled to share the photos with you of this French Acadian style home located in Kingwood, TX. Hopefully you followed along with us on Instagram and Facebook to see the progress photos of this home using #frenchacadian. If so, I'm sure you'll be excited to see the finished product! Duckworth Interiors worked with the client and their builder, Blakecraft Homes, to make all of the construction selections. The plan was designed by Wyrick Residential Design. Since we've got so many great photos of this home, I've decided to break this project reveal into two parts. Please enjoy these exterior photos photographed by Chip Gillespie!! We really agonized over which portions of the house to paint the brick vs. use antique brick and which accents to stain vs. paint french blue. I'm really happy with the decisions we made! The gas lanterns contribute to such a beautiful ambiance! The wood for the porch ceilings was an awesome find by the homeowners, reclaimed and brought over from Louisiana. Love the shape of these rafter tails... These little details add so much. No southern home is complete without a magnolia tree! Outdoor kitchens get so much use in the Houston area. My clients are requesting lots of Green Eggs these days! Back porch ready for sweet tea sippin'. Mind if I hang out here? This is a built-in dog bed, right??? Thanks for looking! What's your favorite part??? 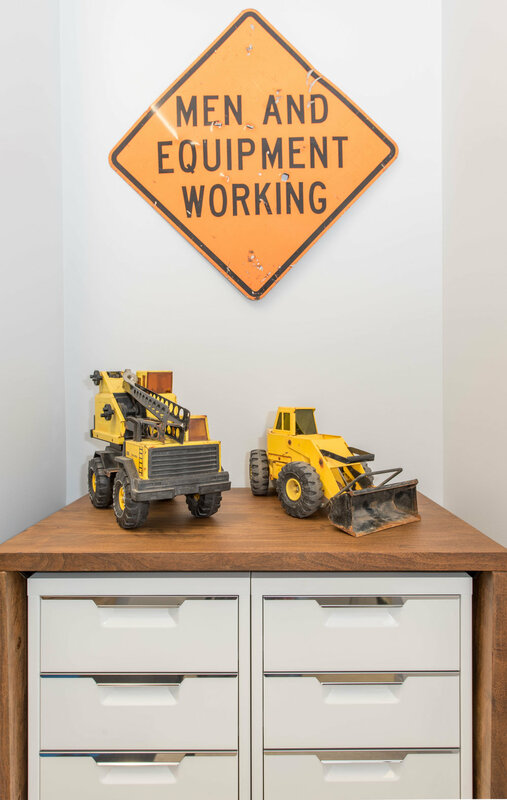 One of our clients owns a nationwide equipment rental company. He purchased an old used car dealership to convert into the corporate offices. After completing his personal home, he invited us to tackle this second project for him and MAN, was it fun! First of all, I need you guys to see what we started with. These are some pics after the walls had been painted and floors were removed. I wish I could find the first before pics, but these will have to do. Yeah. Lots of vinyl composition tile, commercial grade carpet, really just your basic, boring commercial space. The first change we requested was ripping up all the vinyl and carpet and polishing the concrete. We asked for this superficial wall to be added so we'd have a backdrop for the reception desk and a way to divide the reception and cubicle areas. We also needed a logo wall and I think this one turned out nicely. 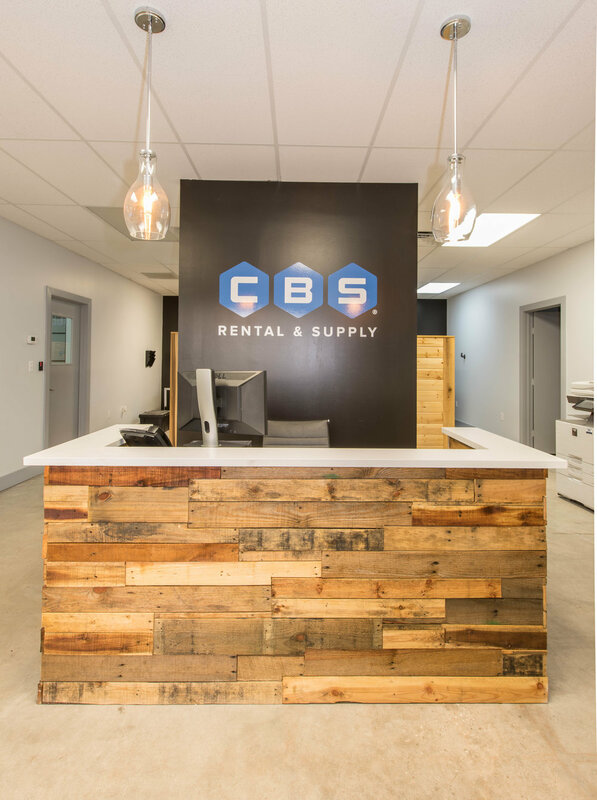 We designed the reception desk and had it wrapped in reclaimed wood. Adjacent to the reception desk is this awesome waiting area. Across from the waiting area is this beverage bar, which we also designed. The countertops you see throughout are Samsung quartz which is a highly durable man made product. We wrapped the countertop on the ends of the cabinets as well and mitered the corners. I LOVE how the cubicles turned out!! These cubicles were super cost effective and they're the best looking ones I've seen. The company is totally paperless... WHAT?! I know, something to aspire to. 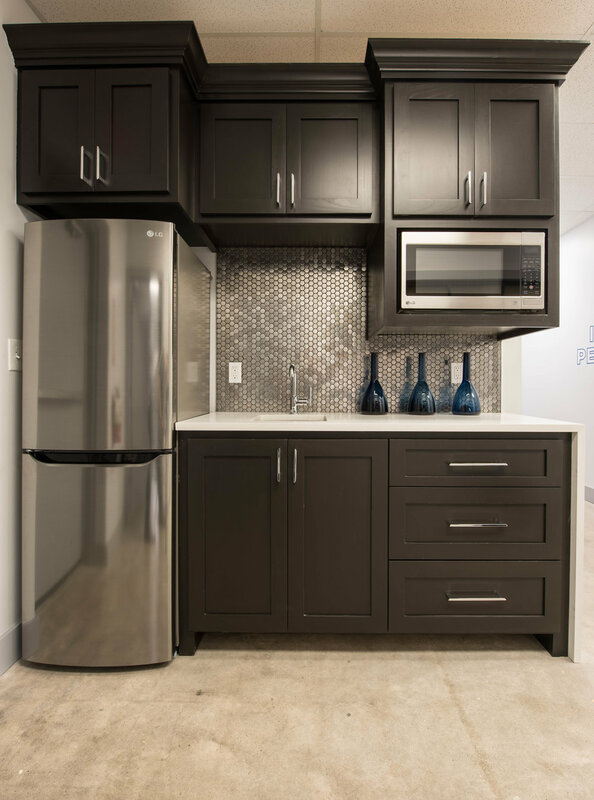 We added a little kitchenette for lunch time and we're kind of in love with how this stainless steel hex backsplash turned out. We grouted it in black for some contrast! We totally updated the bathrooms with textured black tile on the floors, subway tile on the walls, awesome plumbing and lighting fixtures and matte black stall partitions. I know you're going to ask so the big players here are... light: Hudson Valley, sink: Kohler, and faucet: Rohl. This is a great little lounge area outside of the conference room. It's a place to hang out before the meeting starts or a place to step out and take a phone call during the meeting. Yes, that light fixture is made out of a pulley. 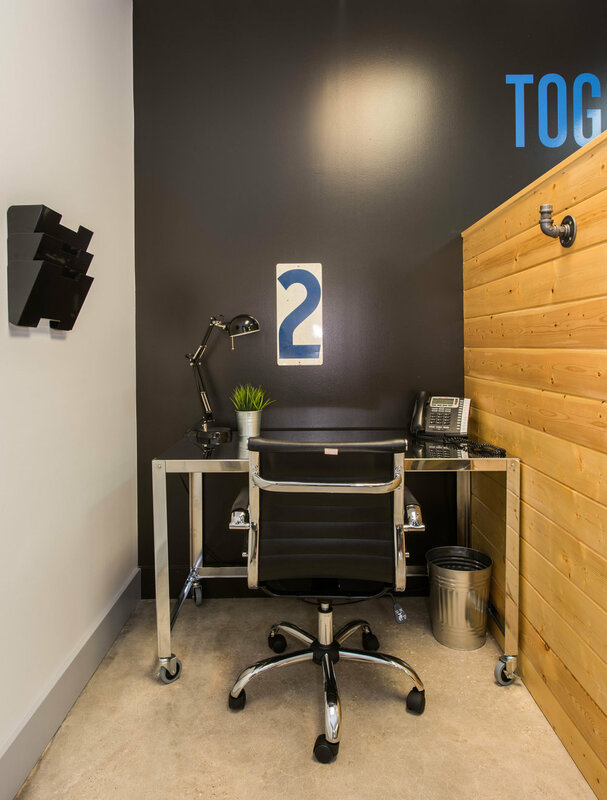 This office was designed for a #girlboss, so we got to have some fun in here. It's a little more feminine than the other offices and we love it! The owner is a wine enthusiast to say the least! So we really embraced the wine theme. We had his desk custom made (by my dad) to incorporate wine barrels for the base. Thanks, dad! The wallpaper is wine labels and the light fixture is a collection of wine bottles with Edison bulbs. The conference room is by far my favorite of the spaces. 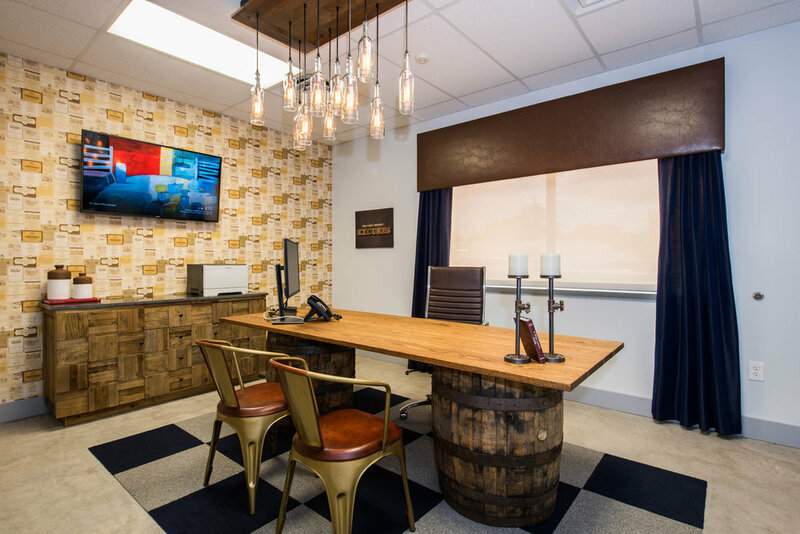 We have a custom beverage bar with the company's mission statement above, awesome console table with live edge wood with tv above, and another wall that serves two purposes. It has a giant glass marker board and a projector screens comes down over it when needed for presentations. 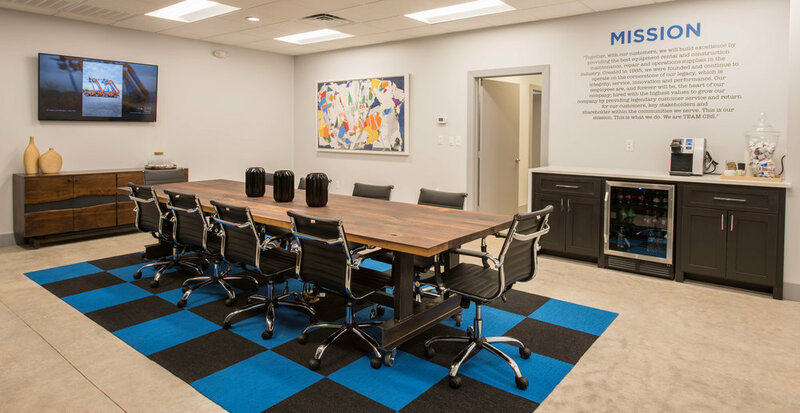 The centerpiece of this conference room is the conference table itself which was custom made for this project by James Ramsey with Refine Manufacturing & Design. We asked for unpainted I-beams for the base and a walnut top. Awesome work, James! Do you ever have an idea that's so good, you can't believe you came up with it? And then when you go to execute it, it turns out better than you imagined in your head? No? Me neither, except for this day. This one day, I was touring one of the company's facilities and I came across this long bristle brush that goes on the front of one of their pieces of equipment. I don't even know what these are called but I thought, "What if we unstack these suckers and hang them on the wall?!" So we did that. We painted the wall black and added some accent lighting. They were a challenge to hang but I love the amazing 3-D, textural impact they have. They draw you into the room. You want to touch them. Best art installation ever. Call me cheesy, call me kitschy, call me whatever you want but I couldn't resist. This is an EQUIPMENT RENTAL COMPANY. How perfect is this? And just for the record, I didn't steal the sign. I hope you enjoyed checking this project out! I really love commercial spaces and hope to get my hands on more of them soon. Also, special thanks to I-45 Signs for all of the vinyl decals throughout the project and New Luxe Bath Glass for the custom marker boards. You're first greeted by the courtyard upon entering this French country estate. The antique brick, massive gas lanterns, and citrus trees contribute to the European ambience. While the homeowners sit at their cafe tables for their morning coffee and croissant a beautiful sound and view can be enjoyed from the fountain which was brought in from Paris. Directly off of the courtyard is a casita. Affectionately referred to as her Marie Antoinette room, the homeowner uses it as her study. The ceiling, walls and molding were all painted a French blue and accented with a gold chandelier, a gold mirror, and gold framed prints of Paris and Versailles. A desk passed down for generations was incorporated with lucite visitors chairs in front so that the view of the desk was not obstructed and the room still feel spacious. Exquisite fabric, which incorporates adapted works from Francois Boucher, were use to create the balloon shades. A baby pink end table, a rose velvet desk chair, and a leopard tufted settee with gold bullion fringe give the room Parisian charm. When you walk through the front door you have the formal living and dining rooms in front of you and beyond that the view of the pool through the windows. A series of lanterns and a pair of benches on top of the hickory floors lead you down the foyer. For the formal areas we've taken classic patterns and furniture pieces and paired them with unexpected colors and textures all while making this home current and timeless. We took a big risk here when we pulled the bright purple and yellow out of the drapery fabric and I think it paid off! A stone fireplace with antique mirror above makes for some interesting art and reflects the treasures displayed on the mantle. The niche in the dining room became known as "the Kate wall". I'm not really sure why other than the fact that I begged to shiplap it. I think it adds some great texture. A specialty finish on the island, hand made tiles on the backsplash and awesome lanterns really make this a cozy kitchen. Many people have said that the breakfast room is their favorite room in this house. I think it's because of the fireplace. You really can't beat a fireplace in a dining area. The family room is off of the breakfast room and is where Bill & Christin relax the most. The custom leather sectional is super comfortable and plush and while we love the continuous lake views throughout the house we needed automated drapes to allow for tv watching. This elegant and glamorous master bedroom is the crowning jewel of this "new French country" estate. An all neutral color palette with metallic accents, make this space conducive to rest and relaxation. Silver nightstands and bench, a gold vinyl sofa, shimmery gold drapery panels, and a bronze accent table all add some luxurious sparkle. The wallpaper and roman shades were selected in the same pattern and an art installation of metal three dimensional flowers above the fireplace compliments the floral motif. A grand four poster bed, crystal light fixtures and a plush rug complete the space. Can I get an "Amen!" over these hexagon tiles??? They really bring me so much joy. We chose to mirror the cabinet doors and drawers to help make the bathroom feel as glamorous as the master bedroom. We can head to the back yard out of the master bedroom to this show-stopping view. The gorgeous pool and spillover spa are accented with travertine and antique brick. Loungers under an umbrella provide poolside sunning and a fire pit near the lake provide an area for fireside conversations. A dining area, under a vaulted, tongue and groove painted ceiling, sits beside an outdoor kitchen. I mean, really? This view! A large covered lounge area with automated privacy screen provides ample seating. I hope you enjoyed the tour! We've got several other projects we're putting the finishing touches on and we're excited to show those to you soon as well. Before you go, drop us a note and let us know your favorite room!